Advertiser.ie - A Festival of Light and Colour in Galway is set for Christmas 2018! An iconic Festive Light and Colour Experience is coming to Galway this Christmas. It will be family focused and will include; an official Light-up Ceremony, large Lighting Installations and Projections on iconic buildings. The magnificent Lighting Features will act as beacons and attraction points. They will navigate visitors throughout the city while providing interactive photo opportunities in some of the most photographed city centre landmark locations. These are spectacular Christmas decorations that are all LED lit, making them very energy efficient. “Light Up Galway” is made possible by a significant grant of €150,000 from Galway City Council. This was approved unanimously by the Mayor and Elected Members of Galway City Council at its most recent meeting. 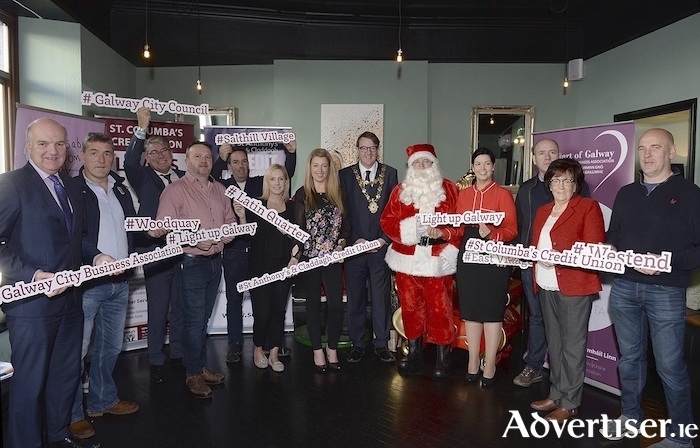 The members of Galway City Council agreed to enhance the experience of Christmas in Galway for residents, visitors and shoppers alike across the city from Salthill, through the West End, the Latin Quarter, the Heart of Galway, Woodquay, Prospect Hill and the East Village around Eyre Square and Forster Street. At the launch of “Light up Galway” in 56 Central, the Mayor, Cllr. Niall McNelis commended all the local business groups for coming together and expressed sincere thanks to his councilor colleagues for supporting this event. The event is being organised by all quarters of the city - The Galway City Business Association, West End, Latin Quarter, Woodquay Village, East Village and Salthill Village with the full support of Galway City Council. The quarters have partnered with respected event planning company Cuttle Consultancy and well-known local events specialist Arcana to deliver a unique expérience. C2 Security have come on board to ensure a smooth and safe event. St. Anthony & Claddagh and St Columba’s Crédit Union have joined as corporate sponsors for the 'Light Up Galway' Christmas Festival which visitors can expect to witness a one off, early evening extravaganza which brings Galway to life, in a fun, creative and colourful way. The Christmas Ceremony and Tour of the City will commence at 6pm on 16th November in Raven Terrace, pass on to the corner of Cross Street and Quay Street in the Latin Quarter where there will be a 20-minute stop. The parade moves up Shop Street and stops outside Hartman’s on Williams Street, for another 20 minutes then follows on to Woodquay for a further stop and finally back to the finale at Eyre Square. The Santa Express Train will be leading the city tour. Santa and Mrs. Claus will follow on Santa’s Sleigh, headed by the Ice King and Queen and surrounded by a whole host of Christmas themed characters including world famous Micky and Minnie Mouse. This year’s events will see a collection on the night for Rosabel’s Room to help raise awareness and support for those suffering from loss of a love one. Ollie Turner will be our amazing MC on the night of Light up Galway. At each location you can expect to see Santa officially turn on the lights along with the Mayor of Galway Niall McNelis along with some special guests and local DJS such as Alan Clarke and Ronan Lardner from Galway Bay FM , local choirs, magicians and Irish Dancers will help ensure this will be a fun filled family event. We are delighted that Galway City Council and Councilors have supported the business groups in the Light up Galway campaign. The 2018 event and decorations promise to be magical. The business sector recognised that Christmas is a special time of year for locals, returning friends and family and our visiting guests, and what a better way to showcase our fantastic City. There is something for everyone and we want our visitors to enjoy the festive experience and cheer. Well done to the local communities for coming together and making this possible. Special thanks to all of the promoters, organisers and sponsors.